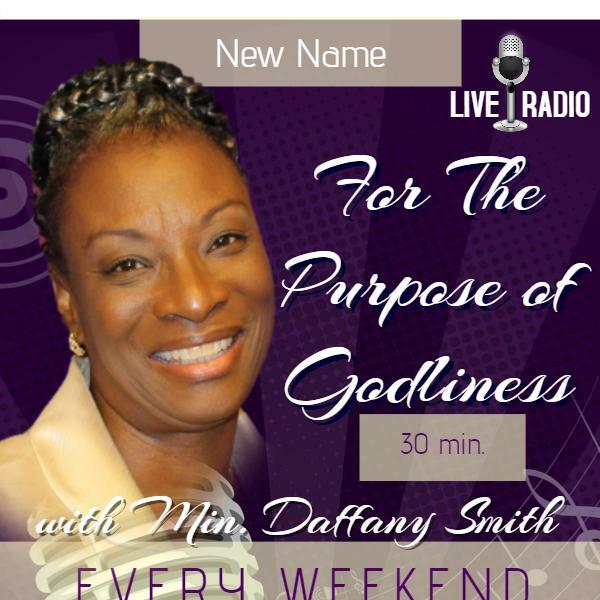 For the Purpose of Godliness w/Minister Daffany Smith, M.Div. "But have nothing to do with worldly fables fit only for old women. On the other hand, discipline yourself for the purpose of godliness" (1 Tim 4:7). "For the Purpose of Godliness" is an empowering ministry is designed to bring Biblical insight to current issues; address your needs and plant the seed of Godly purpose. This ministry shares with you God’s word through the testimonies and ministries of others who will inspire and motivate you to live a life purposed for godliness. You can also call in and share your testimony @ 347-989-0144. Join us every weekend 8:20-9:00 AM Pacific Time. We appreciate your support. Call at 347-989-0144. Please email us at purposed4godliness@gmail.com with your prayer request or praise report. Be encouraged in knowing that God has a purpose for you. Purposed 4 Godliness - w/Min. Daffany Smith - Dry Bones! Purposed 4 Godliness - w/Min. Daffany Smith - Wake Up!